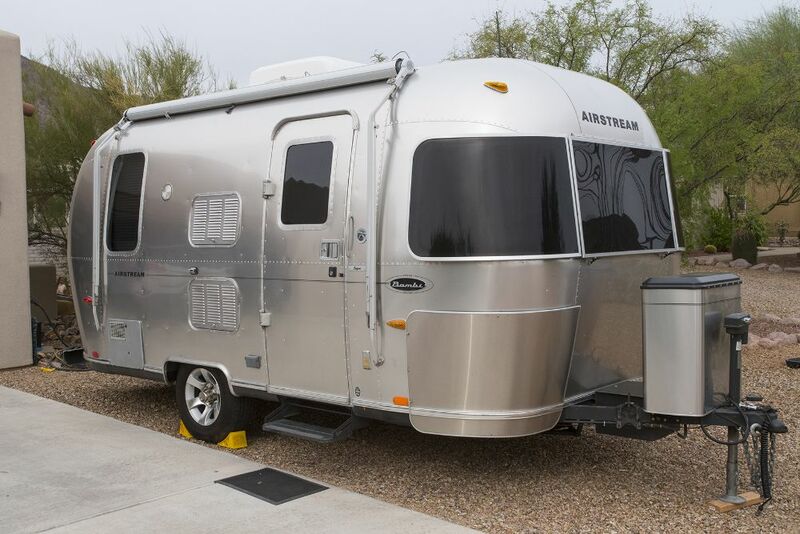 ** PRICE REDUCED ** Well-maintained 2006 19′ Airstream Bambi 75th Anniversary Special Edition in excellent condition. 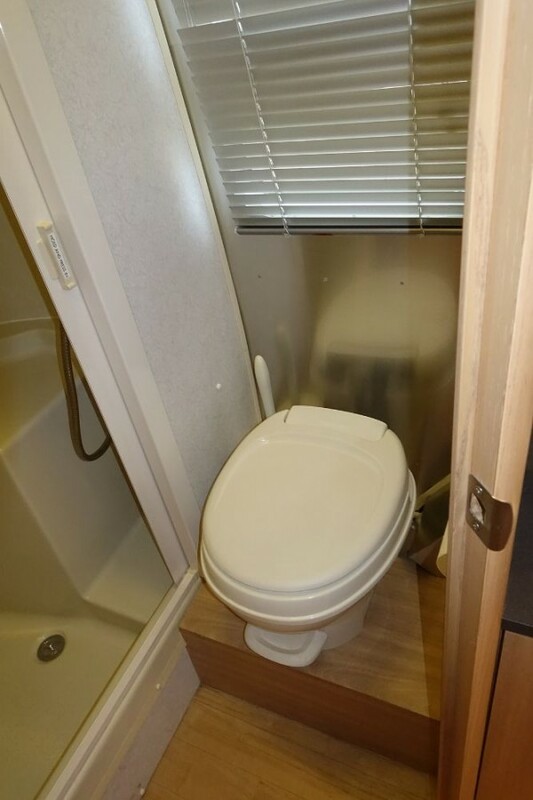 We are the second owners and selling in order to purchase a larger RV. 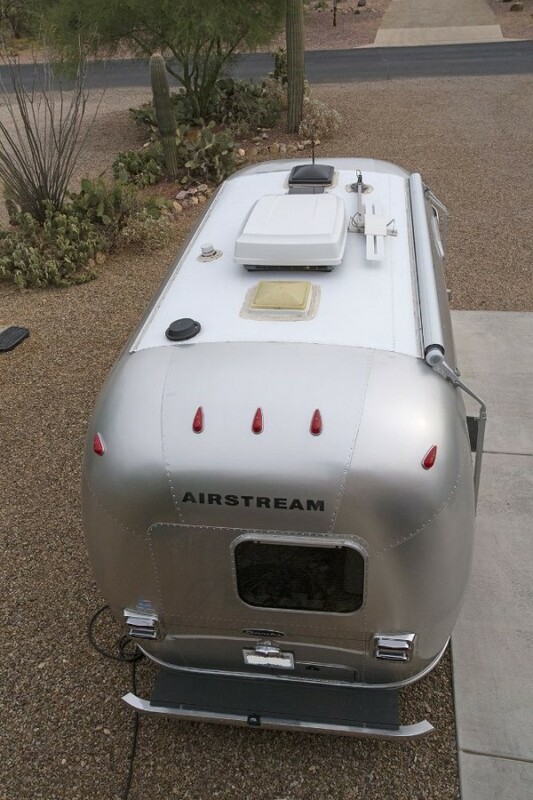 This Bambi has panoramic front windows, with front stainless-steel rock guards, solar window stone guards (one replaced in 2015 and the other in 2017), 6-gallon electronic ignition water heater, 16,000 BTU furnace, See-Level II tank and battery monitor with remote LED readout (installed in 2015); 11,000 BTU air conditioner with heat strip (recently serviced). All smoke/LPG/CO2 detectors have been replaced, and the house batteries were replaced in 2014. There is a roof-mounted solar panel to charge the batteries. The refrigerator heat exchanger fans were replaced in 2018. The trailer tankage is: 23 gallons fresh water, 21 gallons grey water, and 18 gallons black water. Garage kept during winters in AZ, the Bambi is used for twice-yearly trips between WA and AZ. It has never been smoked in, and the interior is very clean with no spots, stains, tears, or other significant blemishes. The only pet is our miniature schnauzer (a non-shedding breed); previous owner did not have pets. 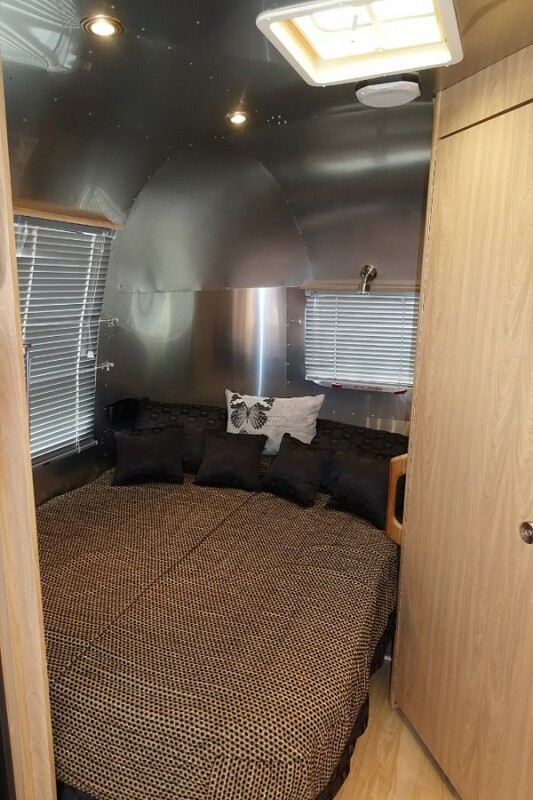 This Bambi has the “Midnight Sun” interior (original bedspread and matching decorative pillows are stored; never used), with vinyl flooring and polished aluminum interior skin. 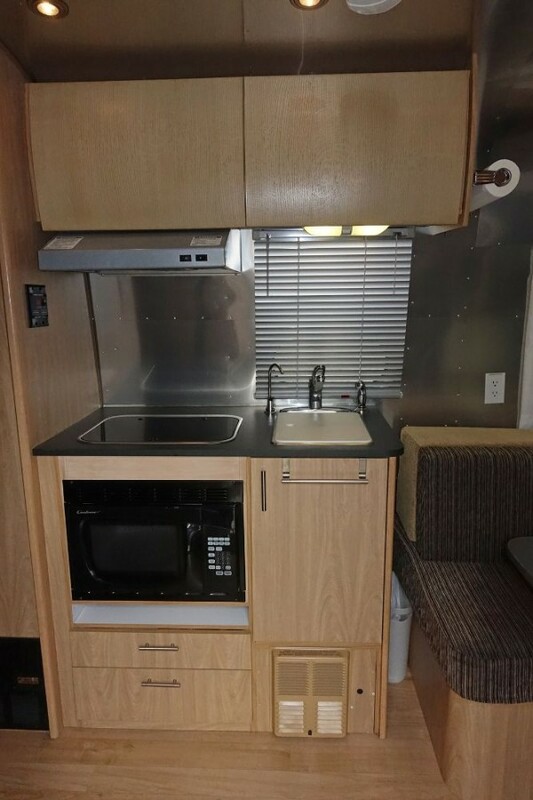 The trailer has a Fantastic Fan (rain-sensing), Sony AM/FM/CD Stereo with remote, two-burner SMEV cooktop with glass cover and microwave oven below. 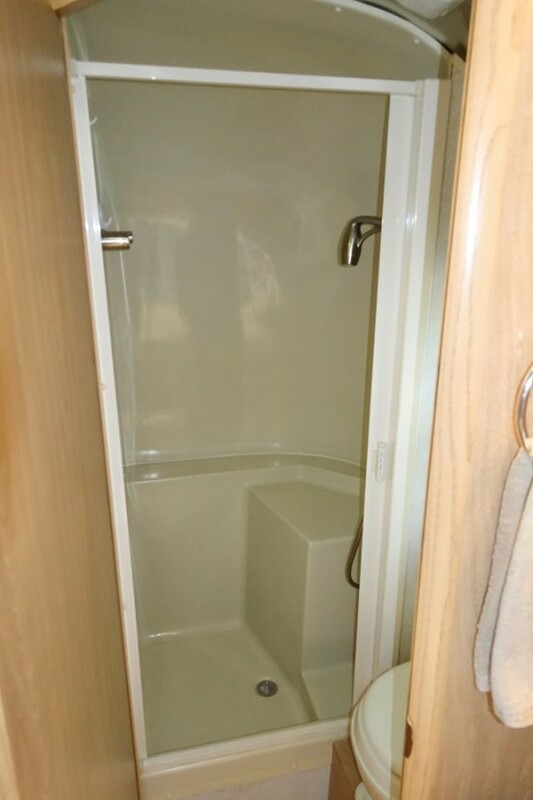 There is a dry bath, and the shower has a retractable door and an Oxygenics showerhead (with dual shutoff valves). 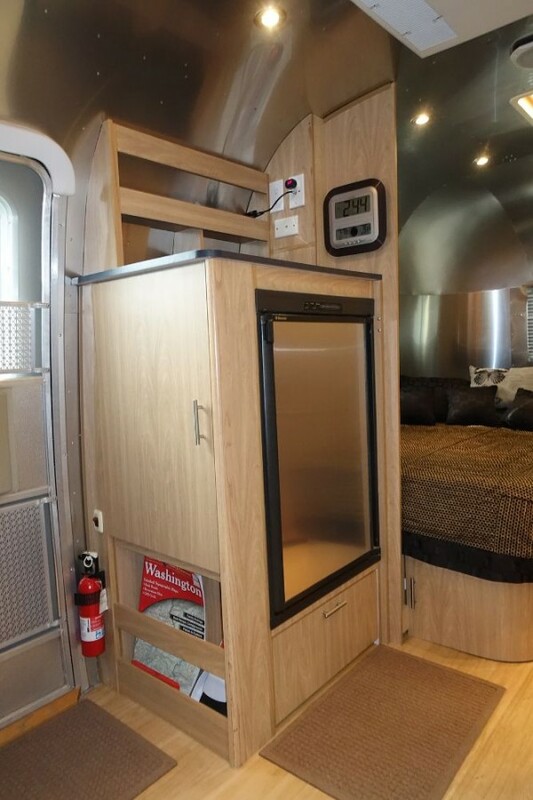 The rear corner bed measures 76″ x 48″ with a custom memory foam mattress topper (2016). 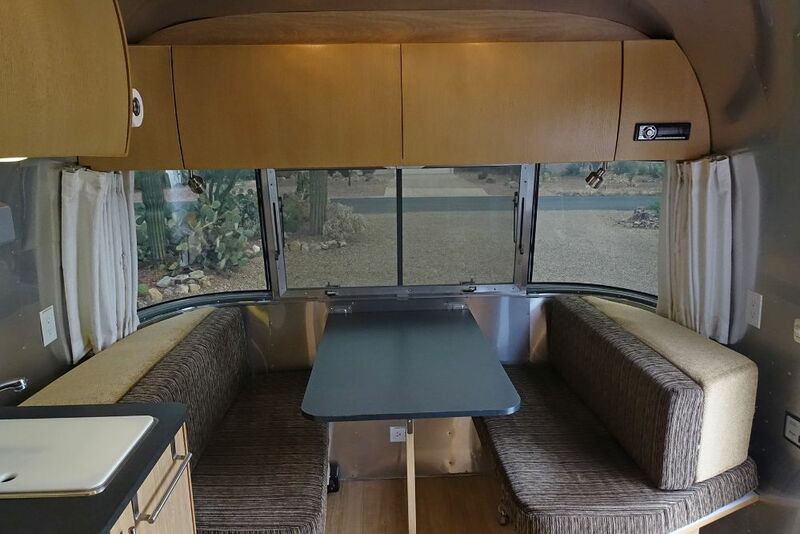 The dinette folds into a twin bed. 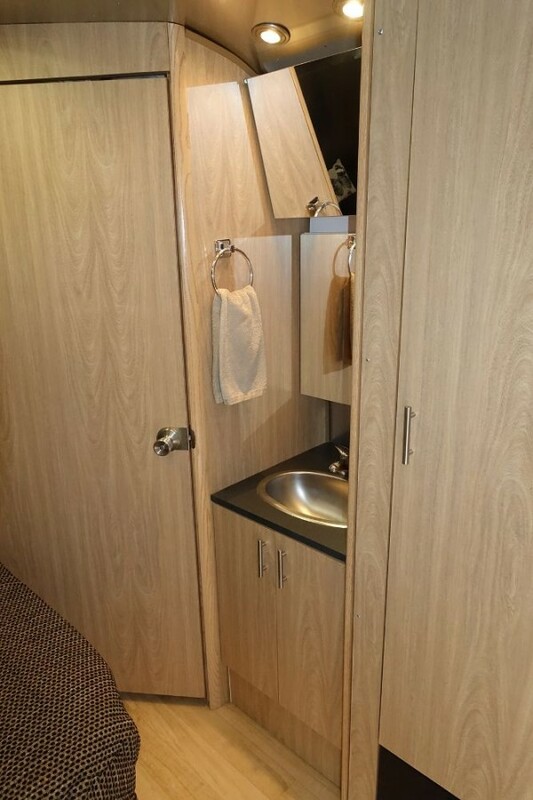 There are aluminum mini-blinds on the bedroom, bathroom, and galley windows. This year a 12V Caframo fan was installed in the bedroom. A special sliding storage tray was installed in under-bed storage cabinet. With an empty weight of 3770 lbs. (4,500 lbs. GVWR), it’s easy to tow with our SUV. 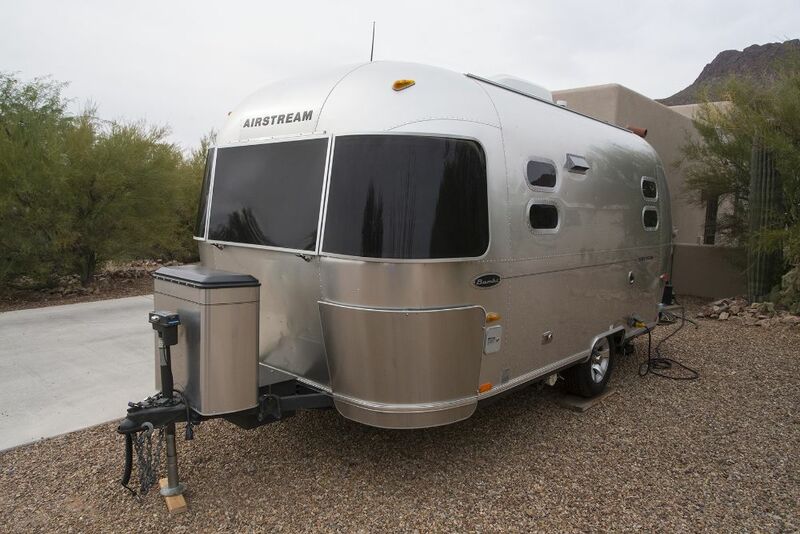 The Bambi includes a load-leveling hitch set-up (electric hitch jack) and a rear-view camera system (hardwired, with connection to tow vehicle at the hitch), with a monitor that sits in special cup-holder mount in the tow vehicle. The brakes have been recently checked and the wheel bearings repacked. The two rolling tires are less than 5 years old. The spare is older, but serviceable, and is installed in the underside bracket. The Bambi was recently Walbernized, which is usually done 2-3 times per year. Hi, George. Left you forum msg regarding looking/purchasing your Bambi. Live up the road in Chandler, hope we can connect. Thank you! We are in Tucson and very interested in seeing the rig-sent two messages but maybe did not get through. Let us know-thanks.